I have acquired a recent love for two things: ground lamb dishes, and Indian food. I had 2 pounds of ground lamb due to expire in my fridge today, and it dawned on me that I could probably turn it into a quick Indian dish. I did a little research and this is what I came up with. This was so quick, and it’s truly unique and addictive! It is so savory with a mysterious note of cinnamon that leaves hints of sweetness. In a large pot over medium heat, crumble the ground lamb until mostly cooked through. Drain cooked lamb to a colander, and reserve 2 tablespoons of fat. Saute onion and garlic in the reserved fat on medium until translucent, about 5 minutes. Stir in all the spices, and the tomato paste. Return the browned meat to the pan, and add broth and lemon juice. Reduce heat, and simmer for 10 to 15 minutes until liquid has evaporated. 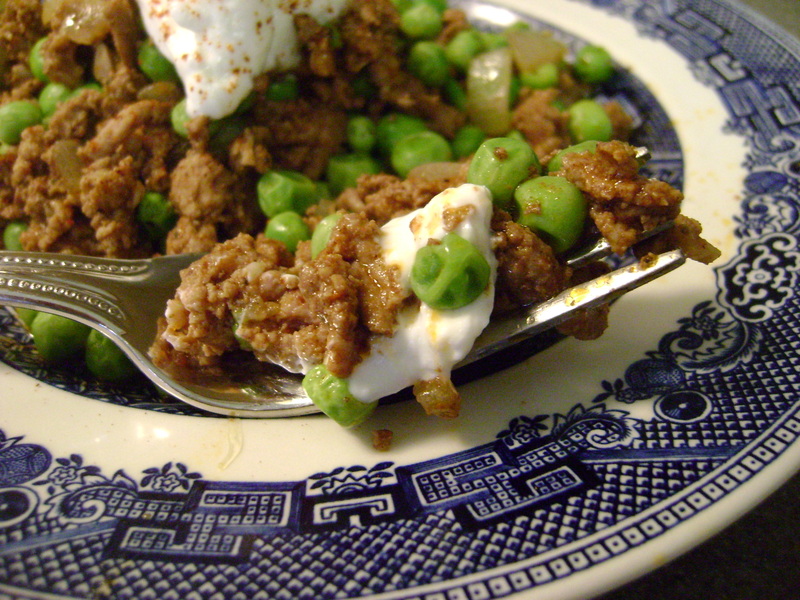 Toss in green peas if desired, and top with yogurt. Typically you would serve this over basmati rice. I ate it in a bowl, chili style. Also it would be delicious served over zoodles, spaghetti squash, or even riced cauliflower. Also, it would make a delicious filler for an omelette, or served under a couple poached eggs. Mouth is watering! Thanks for all of your posts, you are an inspiration! Your food looks amazing… Keep It Up!!! Thanks! How did you hear about our blog?? Let me know if you try this recipe, and if you like it! My Blog is called Primal Spirits, it is no longer Alive & Thrive. Just thought I would let you know so you are not following the wrong one! thanks I will check it out!! I just ordered and devoured Kheema Mattar in downtown San Francisco and it tasted just like this, Leigh! You have such a great knack at recreating authentic recipes! Yum! Made this on Sunday night and it is ow officially one of husband’s favorite meals, plus the kids devoured it too. They requested it be a weekly repeat! This is the best recipe, so tasty!!! This was great! Thanks for sharing such a delicious recipe. I made this again last night and William (5yrs) came in from play delighted to smell his “favorite Indian dish”! Homerun!